How many of you are about to start college? Now, how many of you are vegan and about to head to college? I was when I began my first semester! I was totally nervous about how I was going be vegan and have healthy meals throughout my time in the dorms. It can be a bit nerve racking at first, but don’t worry! 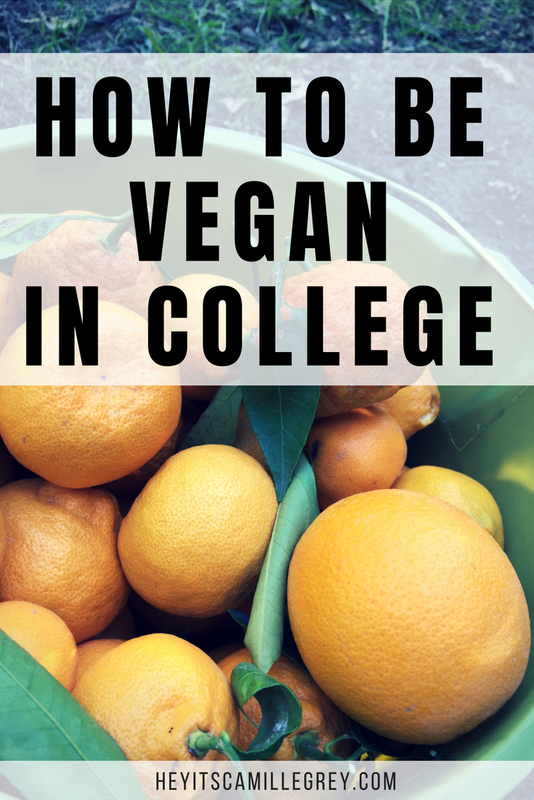 I have so many tips on how to be vegan in college to share with you today. When I headed to college, I was already vegan for a whole year. I had a bit of knowledge on the subject under my belt, which helped quite a bit. I was still nervous about keeping my diet healthy and it took some time to adjust, but I was able to find a ton of ways to stay vegan in college! When I was living in the dorms, my campus didn’t have a meal plan, but money that we could use at any of the dining facilities/stores. This meant I could grocery shop at the campus stores with my dining dollars. This was a great way to save money and buy groceries to keep my mini fridge stocked with lots of yummy food! Don’t forget to follow me on the LIKEtoKNOW.it app and Instagram to see more ways I prepare vegan food in college! This blog post is specifically for vegans living in college dorms. If you guys want a post about being vegan while off campus let me know! I would be willing to bet that all campuses have an area online where you can find the nutritional info and ingredients for all the meals served on campus. Try finding the dining section on the campus website! Before I left for college, I wrote down a HUGE list of everything I could eat. This made it really easy when I would go out to eat with my friends. I didn’t have to hold up any lines by asking if there was dairy in a meal or not. I kept that list on my phone so I could access it at any time. This is one of the easiest ways to be vegan in college while living in the dorms! I personally always kept a gigantic bin of snacks in my dorm room. There were many times that the only thing open late at night were more junky places on campus. I kept a bunch of healthy (and junk) snacks so I would always have food on hand. Some of my favorites are the Hippeas Chickpea Puffs, Lara Bars, and Lenny & Larry’s cookies! If you have a mini fridge, hummus and veggies are a great healthy snack as well! Because a mini fridge is well, mini, it can be hard to store a lot of fridge-only food if you are sharing it with a roommate or two. I tried to stock up food that didn’t need to be refrigerated such as bananas, apples and avocados. 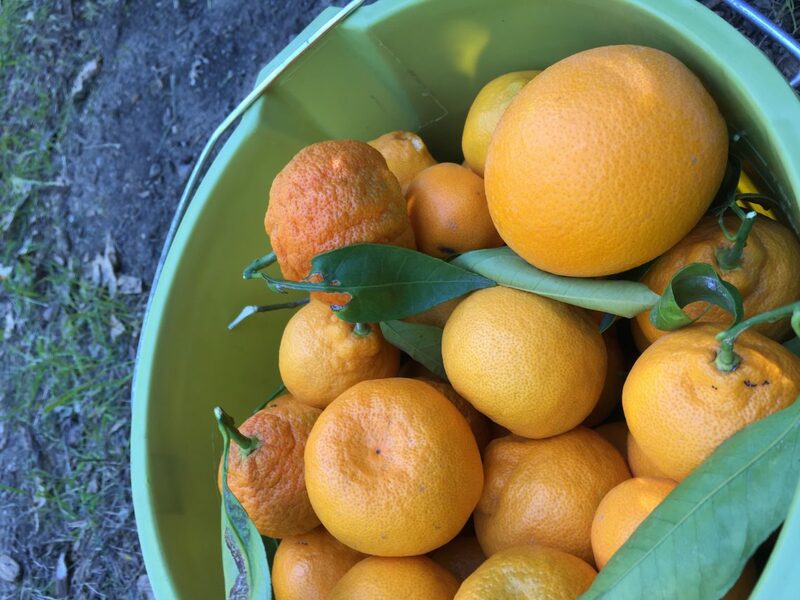 Depending on where you live, you may not have access to a kitchen. If you do, take advantage of it! I made a lot of my own meals in the kitchen or heating things up in a microwave. Our kitchen was shared by over 600 people, but you would be surprised how few times I had to wait to use it. I almost always could go and quickly make something whenever I wanted. I made oatmeal most mornings of college. It was really easy to add oats, almond milk and some toppings and have an entire meal that kept me full for my morning classes. You can always make overnight oats if a microwave isn’t an option for you! When you do get the chance to make something, double or even triple the recipe so you have leftovers! I had containers full of leftovers to get me through the week. I would recommend sturdier food containers that will last you a long time! These ones are microwave and freezer safe too! If you don’t have a kitchen nearby, see if you are friends with someone who does! Maybe one of your friends lives off campus and doesn’t mind you borrowing their kitchen for an hour. You can always entice them with your yummy food! Most vegan’s best friend is their blender. I always kept spinach and frozen fruit in my mini fridge to make smoothies at any time. Check to see if your campus allows blenders in the dorms and if they do, make sure to add it to your packing list! You can blend up soup, smoothies, banana ice cream, cashew cheese and so much more. I used and still use a NutriBullet! 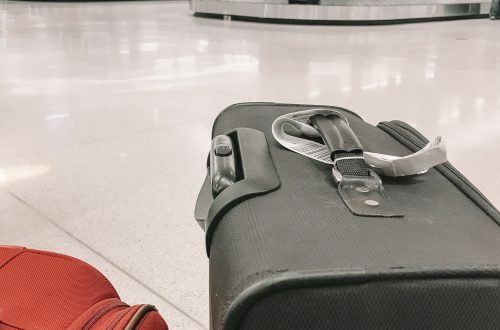 When I started college, I didn’t have a car (or a license!) so it was hard at times to get healthy snacks and such that my campus didn’t sell. I used Amazon Pantry multiple times throughout the year to stock up on essentials that were delivered right to my campus! I bought coconut water, snacks, almond milk, etc. This was really helpful for heavy things that I didn’t want to lug across campus too! Students also get a free six month trial for Amazon prime! This is a secret weapon for those who are vegan in college! This tip is way more fun than the rest! Sometimes you just feel like eating out at a healthy vegan place. Most times, college campuses don’t have those so you need to go off campus. During finals week, I would hit up some local vegan cafes to study and treat myself to a yummy meal. Every once in a while, it’s nice to have someone else cook a meal for you. I did this a couple times throughout the school year. If you are new to your college town, check out Happy Cow. It’s a website that tells you were vegan restaurants/cafes/etc are nearby! 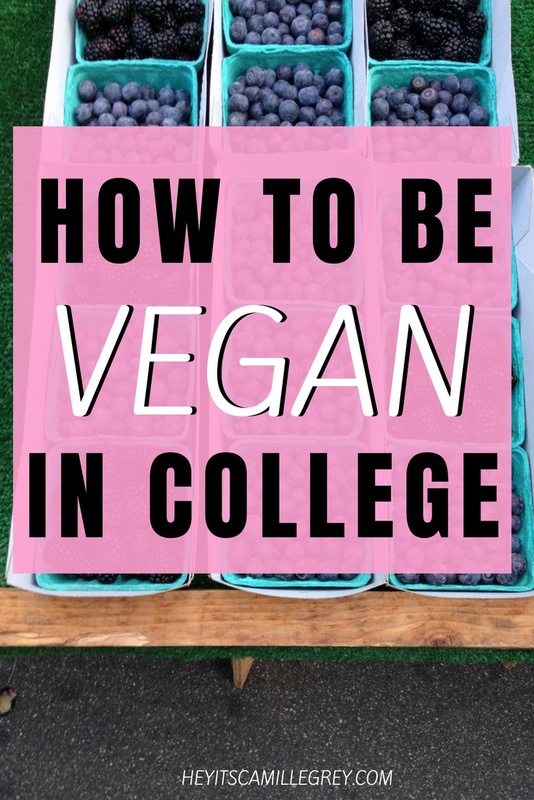 Are you about to be a vegan in college? 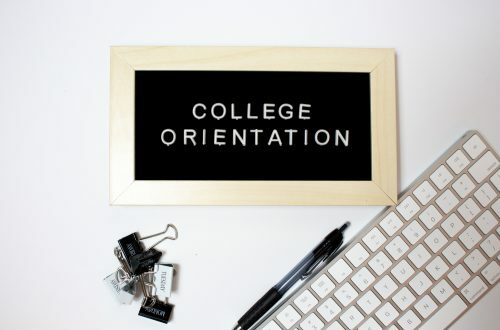 Are you already in college and have any more tips for eating vegan in the dorms? Let me know in the comments below! That would be awesome! I’d love to do some sort of collaboration together!